This boat was "winterized" by placing a space heater in the engine room. 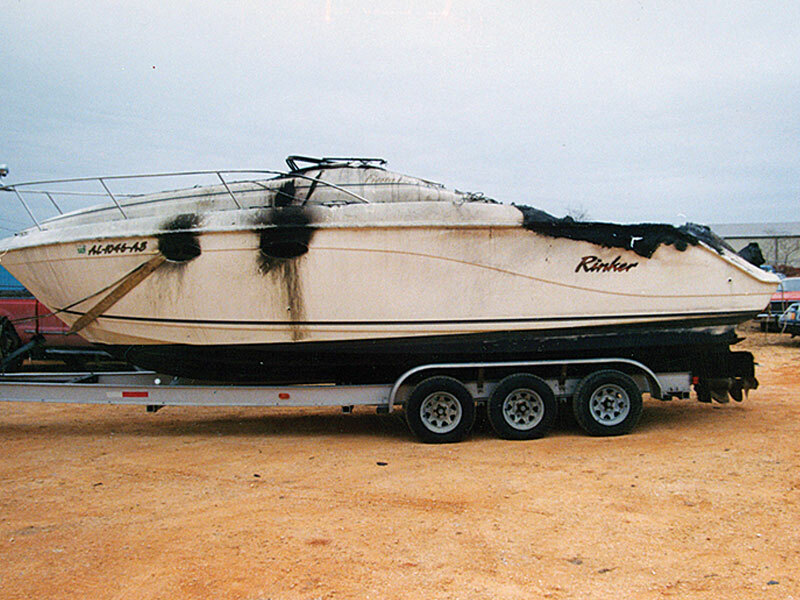 While afloat in the slip, it caught fire when the extension cord used to power the heater shorted. ALEXANDRIA, Va. – You’re putting the boat away for winter. So what half-truth, wive’s tale or tall story have you heard about winterizing a recreational boat? Boat Owners Association of The United States (BoatUS) helps to set the record straight. Ethanol (E10) fuel and engines: If a boat has a built-in gas tank, it’s recommended to leave the tank as full as possible over the winter with a smidgen of room for fuel expansion. TRUE: Leaving the tank nearly full limits the amount of moisture that can potentially condense inside on the tank’s walls as outside temperatures fluctuate, preventing phase separation of ethanol (E10) fuel. Note one caveat: If your boat is stored in a rack system or indoor storage, check with the marina. They may require you to empty the tank to minimize the risk of fire. TIP: Never plug a fuel vent. Ever. Ethanol and phase separation: Come springtime, any phase-separated gasoline in the tank can be fixed by adding a fuel stabilizer or additive. FALSE: Once gasoline phase separates, that’s it. Kaput. End of story. The only solution is to have a pro remove the contaminated fuel and water mixture and start anew -- a difficult, hazardous and costly task for boats with built-in fuel tanks. However, it’s critical to use a fuel stabilizer each fall to help keep fuel fresh over the winter, keep corrosion at bay and to help prevent the onset of phase separation. TIP: Put the stabilizer in before you nearly fill the tank for its long winter nap. This will allow stabilizer to fully course through the fuel system as you run the engine when filling with anti-freeze. Freeze damage: Because it’s cold up there, BoatUS insurance claims for engine block freezing come from northern climates. FALSE: While there are quite a few claims from the colder climates, many boat insurance freeze damage claims also come from southern, temperate states hit by an unexpected freeze or when space heaters fail due to sudden storm power loss. In the northern climes, storm power outages also are to blame for engine block freeze related claims, however, both areas of the country have their fair share of winter freeze claims due to one reason: the failure to follow winterizing procedures. TIP: Don’t let your buddy do the job – it’s a common refrain BoatUS claims staff hears every spring after a cracked block is discovered. Having your marina winterize your boat and systems may offer better protection if there is an issue come springtime. Another option is adding ice and freeze insurance to your boat insurance – most insurers do not charge much for it, but there are deadlines to purchase (BoatUS offers it for as little as $25 to its insured members until October 30). Space Heaters: It’s okay to “winterize” the boat by leaving a space heater running onboard. FALSE: In addition to the sudden power outage problem, every winter BoatUS sees fires from heaters, plugs and cords, and from heaters that were left running on unattended boats. Unless you live in Hawaii or the Florida Keys, BoatUS recommends winterizing your engine if you will be laying up the boat for even a few weeks to lessen the chances of sudden freeze damage. TIP: Save time and make winterizing easier by installing an engine flushing system -- typically a simple valve with a connection for a garden hose along with an anti-freeze pick-up hose/strainer -- on your engine.